The Saints have completed their busy evening by adding some offensive line help. 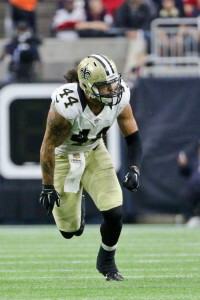 Nick Underhill of The New Orleans Advocate reports (via Twitter) that the team has signed veteran lineman Don Barclay. The 2012 undrafted free agent out of West Virgina has managed to put together a six-year career, most of which came with the Packers. 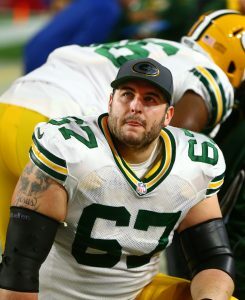 Besides missing the entire 2014 campaign, the 305-pound offensive guard sat out only a pair of regular season games during his Green Bay tenure, and he made 24 starts protecting Aaron Rodgers. Barclay has also appeared in eight career postseason games. He was released with an injury settlement in October and quickly caught on with the Lions. However, after appearing in three games (one start) with his new team, Barclay suffered a season-ending concussion. The 29-year-old will now try to crack a Saints rotation that’s seeking a top reserve. Jermon Bushrod and Cameron Tom appear to have the inside track on that “sixth man” role (via John Sigler of USA Today), although Barclay could certainly provide the duo with some competition. The Saints are also rostering Rick Leonard, Josh LeRibeus, and Bryce Harris. Earlier tonight, the Saints added a pair of wide receivers in Michael Floyd and Brandon Tate. While initial reports indicated Lions wideout Golden Tate would be sidelined for a “few weeks” after suffering an AC joint sprain in Week 6, the veteran pass-catcher participated in practice today, reports Dave Birkett of the Detroit Free Press (Twitter link). Tate’s presence at practice certainly doesn’t mean that he’ll be ready to face the Steelers on Sunday, and there’s every reason that he’ll remain doubtful for Week 8 (especially given that he was recently spotted sporting a sling). But it’s a remarkable turnaround for Tate, and gives him a decent chance at being available in Week 9 even if he can’t go against Pittsburgh. Tate wasn’t the only Lions player to return to practice this week, as offensive lineman Corey Robinson was on the field as well, according to Justin Rogers of the Detroit News. Unlike Tate, Robinson isn’t currently on the Lions’ active roster, as Detroit placed him on injured reserve in September. The NFL now allows clubs to bring two players back from IR, and Robinson appears to be one of the Lions’ choices — he can practice over the next two weeks, and can be activated in time for Detroit’s November 2 contest against the Browns. Last season, Robinson appeared in 14 games as a reserve and made three starts. Free agent offensive lineman Don Barclay worked out for the Lions today, per Adam Caplan of SiriusXM (Twitter link). Barclay, whom the Packers released off injured reserve earlier this week, appeared in 62 games (24 starts) for the Packers from 2012-16. Given his ability to play guard and tackle, Barclay would give Detroit experience all along the line. The Lions are a bottom-six team in both adjusted line yards and sack rate, and left tackle Greg Robinson — who’s filling in for the injured Taylor Decker — is the league’s second-worst tackle, per Pro Football Focus. Vikings safety Andrew Sendejo will serve his one-game suspension in Week 8 after his appeal was denied, tweets Tom Pelissero of NFL.com. Sendejo, who earned his ban due to a hit on Ravens wide receiver Mike Wallace, will be off the field when Minnesota faces the Browns on Sunday. Instead, the Vikings will turn to Anthony Harris and Jayron Kearse to cover opposite All Pro Harrison Smith. The one-game suspension will cost Sendejo roughly $174K, the amount of a single game check.